Bloodless Coup: Is That Confetti You Have in Your Hand? Is That Confetti You Have in Your Hand? 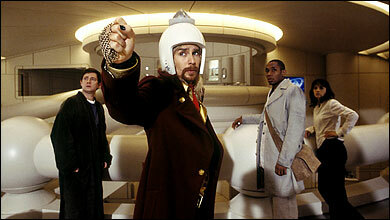 Chalk it up to my Flaming Lips love, but I swear Sam Rockwell looks like Wayne Coyne in this picture from the Hitchhiker's Guide to the Galaxy (and that is somehow so right, because as we all know, Wayne Coyne is from Mars). This movie has me feeling wildly apprehensive, more so than when the Lord of the Rings was in production. The Rings series was a love of my late childhood, and I was ultimately satisfied with the product (hey - there will always be compromises in Hollywood and aside from dwarf tossing Jackson did a good job). It was fairytale-ish, but that was OK, and somehow that connection from when I read the series - something like 5 times in 8th grade alone - stayed with me. Hitchhiker's Guide, however, came later, one of those books that smacks you in the head when you're most confused as a late adolescent/early adult, and gives you something to grab on to. It wasn't that it showed you good and evil in an epic struggle like Rings, but that every one of us is lost - in a way - yet in keeping moving and continuing the adventure of life will be alright -in a way. And the Hitchhiker's Guide did it in a way that was funny, clever, sweet and not preachy. With a wink. That's why this review makes me guardedly hopeful. Dare I say: "I can't wait?" i too now am cautiously optimistic. dargis is a tough critic, and she seems to recognize strengths in the film that reflect strengths that animated my pleasure in the books. oh, and a propos this: "that connection from when I read the [Rings] series - something like 5 times in 8th grade alone - stayed with me"
I quite enjoyed it. I would have preferred working in the book a bit more (since that stuff seemed to work really well), toning down the love triangle a bit, and adding more Marvin, but those are just little matters of taste - I thought it was good. As far as standout individuals, I really liked Bill Nighy and Mos Def. Well, there were some things I was a bit peevy about, such as making Zaphod more lucky than clever, too much love triangle, and making Marvin less anthropomorphic than I expected (in the book he is described as a metal man who slouches against doorways). However I agree that Mos Def was perfect, and Bill Nighy is just great. Anyone who hasn't seen Nighy in Still Crazy should rent it, now. This morning I was talking to someone who disliked the casting of Arthur Dent, but I liked him. The movie could have been awful, but it was pretty good. I'm happy. And in reading about, there are clearly people less easily pleased than we.